Raw Un-Sweetened Organic Greens Superfood Powder– I have a green drink every morning- it helps maintain my ideal weight (even through the holidays). Alkaline superfoods like spirulina and chlorella detoxify my body, and keep me healthy. Zint Collagen– I also have 2 TBS. of this every morning, in my smoothie. Collagen’s loaded with health benefits. All I can say is, for several years I had inflammation. Now I don’t. I’m even running up hills every morning. STILL no inflamed, swollen knees! There’s lots of great stuff online, and I want to help you find it. Happy shopping! I’ve listed all kinds of favorite products in lists below. Just click on the headings to pull up each headings’ list. Acai Freeze Dried Fruit Powder, Organic – I add dried acai berries now and then to a batch of whey protein powder I mix up. I include various dried super-fruits, herbs & such… Convenient way to get extra nutrients, in one fell swoop. I mean, scoop, ha…Natural antioxidant too. Asafoetida– Often used in Indian recipes, asafoetida has other potential benefits as well: a mild stimulant for mental focus; it might be a helpful digestant, addressing irritable bowel syndrome (IBS), possibly improving blood levels of cholesterol and triglycerides too. At one point, I noted that some form of this stuff was added to special (& very expensive) face creams, as it’s been known to soften skin (callouses, etc.). I haven’t figured out how to work it into my face cream though! Ashwagandha Root Powder, Organic– Natural thyroid remedies! This herb may help, and has other qualities too. As an adaptogen, ashwagandha can act as needed, filling various nutritional/hormonal needs- improving sleep at night but earlier in the day, improving energy; decreasing anxiety but increasing libido; improving concentration… Sounds “Dr. Oz”ish, ha. But I’ve noticed some improvements, and the taste’s not bad in a smoothie or tea (a bit like ginseng). Highly recommended by Jen! Astragalus Root Powder– I like to add astragalus root powder to a smoothie mix- it reduces inflammation (by reducing nitric oxide levels released from cells). Perhaps its best used to strengthen the body when cold season or viruses hit; as an immune-enhancer. But it’s touted as “anti-aging”, and has been thought to have anticancer properties. Studies show it can activate enzymes that stimulate telomere production. Bottom line: Reducing cell death from aging and cancer! And though I don’t mix every one of my herbal powders into every batch of my protein mix or breakfast bars, I switch it up- now this, next time that… (just so as not to build up an “immunity” to the particular effects). Baby Supplement- Cod Liver Oil– Remember when grandma (or your grandma’s grandma) used to give the family a spoonful of cod liver oil every day? Well- don’t forget the baby! We don’t always have the most nourishing foods available, so it doesn’t hurt to get some of the really good stuff as an insurance hedge. Beet Root Powder, Organic– I can’t always deal with fresh beets… I know they’re so good for me (got my iron levels up & all), so if time’s short, I’ll add beet root powder to my smoothies- easy style! Black Cherry Juice Concentrate, Organic– Loaded with nutrients! I like to go organic with cherry products though, since it’s a dirty dozen. Found to reduce gout-causing uric acids, this might help arthritics too. Black Cumin Seeds, Organic– This seed is a natural food with potent medicinal qualities, from the Nigella Sativa plant. Purported to help Candida, even fighting cancer and addressing autoimmune disease, it might also help with asthma and allergies, ease eczema, improve inflammation, digestion, and help skin too! Only 1-2 teaspoons daily is needed, best ground up in a little coffee/spice grinder, and sprinkled over oatmeal, smoothies, soups, etc. I gag my ground seeds down by mixing with honey and swallowing whole. My husband can eat them (mixed with honey), which is more than I can say! Black Seed Oil: AKA black coriander oil or black oil, this might help combat super bugs like MRSA; see above entry, for other features. The thymoquinone (TQ) in this oil seems to protect the heart, promoting good cholesterol levels, normalizing blood pressure. But the TQ is also what gives this product a pretty nasty taste. Some folks may get other products with a milder taste, but they’ll also be milder in their medicinal qualities. Another feature of black seeds or oil: it can raise levels of glutathione in our bodies, which can prevent cell damage due to free radicals, heavy metals and such. And many have found relief from skin problems, using this oil topically. Brewer’s Yeast: This is a great natural source of B vitamins. Helpful when so many foods are more devoid of nutrients, thanks to over-farming, etc. Cacao Nibs, Organic, Raw, 5 lb.– Best value on organic cacao nibs. I lightly roast these, then process into “fudge” (only way healthier)! I add dates, macadamias, sea salt and coconut oil (or honey, grass-fed cow butter, etc. )- YUM. Cacao Nibs, Organic, Raw,1 lb.– One pound of cacao nibs is more some folks’ speed. Cocoa + peppermint tea = healthy AND good. Or mix with dates, nuts, & coconut oil for candy “bark”. A chocolate fix w/out the extra (weird) fats and sugar! Chlorella Powder, 2.2 lb.– A better price than the 1 lb. “NOW” brand, for a good chlorella. Binds with mercury to help with detox. Cod Liver Oil Capsules, Norwegian– I personally love my Blue Ice Cod Liver Oil. But when it’s not on sale, I’ve bought this particular brand. Seems to be a quality product, and a great way to get your Omega 3s. Cod Liver Oil, Fermented, from Blue Ice – Helps balance your Omega 3/6 ratio. Yes, another option is to eat plentiful rations of wild-caught salmon, but that’s not always convenient. I buy the liquid form of this CLO from “Renewed Health Supply”- cheaper but not as convenient. Being enclosed in a capsule keeps this cod liver oil extra fresh. I initially got it because of rave reports on it improving dental health. I haven’t needed a root canal that was originally suggested, so… could it be? Also, some folks say this stuff helps with skin issues- acne, little bumps on the arms, etc. Maybe that’s what got rid of those bumps for me?! Cod Liver Oil Mixed w/Royal Butter– There is a great synergy when butter and cod liver oil are taken together. The butter in this stuff is special- from grass-fed cows, so it’s real high in extra vitamins. (Plus, grass-fed butter has a much healthier nutritional profile than regular butter.) I personally just add some grass-fed butter to my smoothies, so it will help my body utilize the cod liver oil to the max. It’s cheaper, but these capsules are easier! Cranberry Extract, Organic– This is my latest fave for flavoring kombucha. I bought it to share with a friend who was trying to ward off bladder infections, and I decided it wouldn’t hurt to add it to my kombucha’s second ferment. I’m sure it helps to keep our health top notch, plus–it tastes great! Desiccated Liver, Argentine– I’m prone to anemia, and the iron from beef liver has a much better assimilation rate than iron from plant sources. Some folks shy away from liver supplements, nervous that they may ingest toxins. Yes, the liver neutralizes toxins (drugs, chemicals, poisons), but it doesn’t store them. Toxins will more likely accumulate in fatty tissues and nervous systems. What IS stored in the liver? Vitamins A, D, E, K, B12 and folic acid, plus minerals (iron, etc.). Guess I’ll keep taking my liver supplements! Desiccated Liver, Grass Fed– This quantity took me over a year to go through- it’s the extra-large size of the above, from a different company. I put it in a green drink that I guzzle down. It’s not gonna taste great, but I haven’t had any anemia! Diatomaceous Earth– Some folks swear by this stuff for Candida and other yeast problems. I like that it will bind with toxic metals in the body, helping with detox. Some folks love it for hair, skin, and nail health. I drink 2 tsp. each morning, half hour before breakfast. (Giving myself a month or so off.) And I give half that much to my dog! (Cuz it’s ‘sposed to be good for them too, and can rid them of worms and other nasty parasites.) Another plus- it shouldn’t mess with other beneficial bacteria in our gut. Perfect! Eleulethero Root–For cold relief, fatigue, high cholesterol; the list goes on! A tonic to boost the immune system, and more. Forskolin (from a variety of Coleus plant)– This natural appetite suppressant increases lipase in our body, and an enzyme called cAMP, which might improve metabolism, increase fat loss and help break down triglycerides. I noticed a big difference when taking “ThyroGold” (an OTC thyroid supplement from NaturalThyroidSolutions.com). ThyroGold contains a small amount of forskolin (“forskolii”), and my body fared much better weight-wise, when using that product compared to when I used Armour Thyroid (which was dried thyroid gland only). I suspect it was the Forskolin that really helped. Note: there isn’t really a magic bullet for weight loss, and some folks might not notice any difference. But for me, there WAS a difference! Forskolin may also increase testosterone, and protect against cancer and inflammation. Wow! Also, while it might improve high blood pressure, those with low blood pressure might find it lowers theirs too much. Gelatin, Organic– From grass-fed cows, this gelatin is great for joints, skin, hair, cellulite, nails, etc. It’s not a complete protein, but supplies the body with oft-missing amino acids, to balance that modern diet so many of us consume. I don’t always have time to make bone broth, which is an excellent, healing food (it even has extra minerals in it). Not so excellent- how much time it takes! This gelatin is much more convenient- I’ve been using this for swollen knee issues. It seems to have resolved the problem (though it took two months or so to take effect). I mix it into hot beverages (it won’t mix well into cold foods, unless dissolved and heated first). I LOVE that it’s from grass-fed cows! Gelatin Collagen Hydrolysate– Like the gelatin above, collagen hydrolysate fights inflammation. So it’s good for the joints, and also, skin, hair, etc. But a nice feature of this form of gelatin is that it will mix well with cold foods, unlike straight gelatin, which is best mixed into hot foods. So it’s great in smoothies! Goat’s Milk Whey– Of course this is processed at low temperature (retaining more nutrients). It contains more than 20 naturally occurring minerals, and is real alkaline, which helps reduce acidic deposits in arthritic joints. It’s helped some folks with acid reflux, it helps decrease inflammation, and it’s helped some with Osteoporosis, to improve bone mass. I feel like it’s helped me a lot- the iron in it is highly absorbed too, which is a plus! Heather’s Tummy Fiber (Organic Acacia Senegal)– This typically helps folks with IBS. But Heather’s tummy fiber also helps keep one regular, and improves gut flora. I add this acacia senegal to my protein powder, as it seems to promote good digestion. Hemp Oil– The gamma-linolenic acid (GLA) and stearidonic acid (SA) in hemp oil are believed to be anti-inflammatory. Cool! And the GLA and SA might help skin disorders, acme, and eczema, and improve the immune system. Also, hemp seeds don’t contain phytic acid, the anti-nutrient found in almost every other seed, nut, or grain. Hemp oil does contain a good amount of Omega 3s, but it’s still higher in Omega 6s (PUFAs), which means it can go rancid easily. Store oil in the refrigerator and use regularly, to maintain freshness! Honey, Raw, Unfiltered, 3 lb.– Now that I make Jun Kombucha (which feeds on green tea and honey), I keep raw honey in stock. This is a decent price, too- about $6.65/lb., which is quite reasonable for a raw honey. I feel like it tastes even better than regular honey too. Kefir Grains– This is a non-dairy way to get probiotics. No need to purchase pricier organic milk kefir or yogurt when you have water kefir on hand! I brew these kefir grains with water, sugar, and a splash of molasses, which, when brewed in these pretty blue bottles turns into “healthy soda” after the second ferment. Kombucha Culture (1 SCOBY + 1 c. starter liquid, makes 1 gal. )– If you don’t have a friend with a spare scoby starter (and you don’t want to just get a bottle of unpasteurized kombucha to start some), get this scoby starter from Kombucha Kamp- good reviews! Cheaper starters might come with white vinegar instead of real starter liquid, or die off during too-long shipping, etc. Liposomal Glutathione, Non-Soy– Extracted from organic sunflower seeds, bound in a lipid to help the body use it properly, liposomal glutathione is known as the “master antioxidant”, aiding in metal detox too. The health-challenged may want to resort to this. Liver Powder- This is the most economical way to get your iron. I mix mine in with my morning green powdered drink. It’s Argentine liver, from grass-feed cows. Undefatted, and pesticide and hormone Free! Maca Powder, Organic– This product has been “gelatinized”, meaning the body can use it more easily than raw maca (which can cause digestive upsets). It’s called a natural endocrine adaptogen; it contains nutrients to support normal hormone production. By stimulating/nourishing the hypothalamus and pituitary glands (which regulate other glands), the whole body becomes more balanced. That might explain why some have seen it reverse hypothyroidism, adrenal fatigue, infertility. It’s also known as a libido enhancer for both men and woman, helping reduce post-menopausal symptoms as well. With its high iron content, it can even help with anemia. Some folks take it just for increased energy in general- there are lots of great reviews on Amazon. Matcha Green Tea Powder– What?! “Metabolism boost, good for hair/skin”, AND 137 x the antioxidants of brewed green tea?! Luv this matcha green tea powder. Seems a tad pricy, but we’ve had some every day for over 2 months, and haven’t run out yet. I look forward to the extra kick I get from it- mellow but exciting! Excellent flavor too. Pomegranate Powder, Organic– I love adding pomegranate powder to a batch of protein powder- easy to whirl up a smoothie with extra flavor AND extra nutrients. Oh, plus, a great color! Protein Powder, Whey, Grass Fed, Cold-processed – 5lb.– See more below, under “Whey Protein Powder”. Psyllium Seed Powder, Organic– This natural psyllium seed powder is also found in brand-name products designed to help with gut health, constipation, even colon cancer and high cholesterol. I use it as part of a cleanse too. I prefer it over psyllium seed husks, which isn’t a whole food like this product is. Red Palm Oil– Loaded with Vitamin E (in a form we can readily use), and Vitamin A; this organic, extra virgin red palm oil has a “nutty” flavor. OK, a sort of strong flavor. But when used in dishes with garlic, spices, and paprika, it’s not overbearing. A fave healthy snack Rose and I love are truffles made with this stuff (plus cocoa powder, honey, palm sugar…). I LOVE that RPO goes straight to the liver- instant energy the body doesn’t have to process more before using as energy! Saffron, Mehr Premium– Of all the varieties, mehr saffron is top-of-the-line, and superior to powdered. Crush and add to simmering dishes, or soak 1 part threads (about 20) in 3 parts hot water, 2 hrs. (or up to 12 hrs. ), then add to dishes. Saffron’s become big as a memory enhancer and appetite suppressant, but it’s always been gourmet, for pilafs, stews, risotto, paella; stews and soups too. Superfood Powder by Dr. Schulze– A handy mix to add to smoothies, to insure ultimate, natural nutrition (without having to get all the ingredients separate, like I do for my “Fruity Mix“). Nutrients in this powder are from natural sources. Vitamins can be manufactured synthetics, but they might be missing some (yet undiscovered) components crucial to our nutritional well being. I think natural’s the way to go! Superfood Tablets by Dr. Schulze– OK, not everyone wants a green smoothie. These tablets make it easier to take, for some. Tart Cherry Juice Concentrate, Organic– This can help control blood sugar and cholesterol levels. Another study found that adding this to the diet decreased abdominal fat and inflammation. And, it can improve muscle recovery after workouts. I love adding this to my kefir and kombucha ferments. Tart Cherry Powder, Organic, Freeze Dried– It takes 52 lb. of organic cherries to produce 1 lb. of this organic tart cherry powder extract. So this is a good value. Non-organic cherries are pesticide-laden… not these! I mix this into batches of whey protein powder. So good, and medicinal too- anti-inflammatory, and helping reduce bad cholesterol levels. Turmeric Curcumin Extract Capsules– An excellent anti-inflammatory, natural style! Take this with a touch of extra virgin olive oil or coconut oil for maximum absorption. Amazing results for folks with arthritis, bursitis, joint pain. And the capsules are easier to take that shaking turmeric spice all over everything (although I often do that too!). Turmeric Powder– Some of us would just as soon use the actual turmeric spice- a colorful bright yellow powder with no prominent flavor, but chock full of antioxidants. As mentioned above, it’s also anti-inflammatory. I add this spice to other colorful foods in cooking, and might add some to tea or smoothies as well. It’s even been connected with improvements in Alzheimer’s patients; for many reasons, it’s a great spice to incorporate into our diet however we can! Whey Protein Powder, Grass Fed, Cold-processed – 5lb.– This is my fave whey powder- fills me up, keeps me going, and it is a great price for a whey from grass-fed cows! Yucca Root,1 lb.– I love food supplements with health-improving qualities, like this yucca root powder. It contains certain chemicals that might reduce high blood pressure and high cholesterol, arthritic pain, swelling, and stiffness. I stir some boiling water into a mug with a 1/2 tsp. of this and some cinnamon- it’s slightly bitter, but that’s a good thing. (Think, like coffee, right?). Or I add it to a batch of my “Fruity Mix” of protein powder, which I use every morning. I’ve added it to some of my healthy fudge/breakfast bar mixes too- good stuff. Zinc Lozenges– Although we rarely get colds anymore (must be all the crazy super-foods we eat), my husband still loves to have these on hand, to keep a cold at bay. It’s always nice to avoid a full-blown cold, and these lozenges seem to do the trick! Other folks have taken these to get rid of acid reflux, too. Alfalfa Sprouting Seeds– We grow a lot of alfalfa sprouts at The New Deli, and this is a great source for them. Best price I’ve found; they may seem expensive but the yield is excellent!Chipotle Peppers– This product is great. At The New Deli, we take a portion of the dried chipotle peppers, chop coarse, and let sit in a bit of boiling water overnight. Then we add some salt and process in our food processor, adding a bit more water and some olive oil. Makes a great paste that we can add to soups, sauces, and our ever-popular chipotle dressing. WAY better than buying other chipotle products that are mostly just cheap ingredients with a touch of chipotle in ’em. And yes, this company sells smaller quantities, but this is an especially good value at this price. Cinnamon, Ceylon– Benefits of ceylon cinnamon include potentially reducing blood sugar, cholesterol and triglyceride levels. It seems a bit pricy, but other cinnamon varieties (Indonesian, Saigon, cassia cinnamon) contain high levels of coumarin, which can mess with liver function- no good! I noticed an impressive difference if flavor too- this stuff is deee-licious! Coconut Manna, Organic– This is pure coconut, pureed smooth, to use for sauces, smoothies, soups. It can go by other names as well: coconut spread, coconut butter, coconut cream… It contains the pulp (yay, fiber), plus oil (good for brain/metabolism/etc.). A delicious whole food. Make Jen’s Coconut Bark with this stuff! Green Tea, Organic– This is a great loose tea for brewing Jun Kombucha. It’s a fairly large bag, but it lasts me a long time and is a good value. Herb De Provence– Marshalls Creek carries “refill” bags of various herbs & spices, at the most economical price (and free shipping w/orders over $25). Honey, Raw– Be (“bee”) sure you get quality honey. This raw honey will contain bee pollen too- not so with most grocery store brands. Fight allergies naturally! Olive Oil, Extra Virgin– This is a flavorful, 100% pure, extra virgin olive oil. Many “olive oils” are actually blended with cheaper oils. Test by refrigerating- it should get solid. An excellent, healthy oil for salads, dipping, even cooking. Available at Costco too. Paprika, Organic, Smoked– We roast peppers at The New Deli, but this organic smoked paprika sure is a short-cut, when we want to add extra flavor or color to a dish. We really love that this is organic, since peppers are on the dirty dozen list (conventional peppers are more likely to have pesticides). Porcini Mushroom Powder– Perfect to add richness and flavor to soups and sauces. Pricey, but it is very concentrated, and lasts a long time. Wheat, Whole Grains, Organic, Hard Red Spring, 25 lb.-These organic hard red spring wheat berries grind into flour in my Vitamix. (I freeze ’em 1st, so they don’t heat too much.) Makes awesome sourdough whole wheat bread! Forskolin “Fat Burner”, Appetite Suppressant– I noticed this ingredient listed in the OTC thyroid capsules I was taking (hummm… “secret ingredient”?). When I’ve been on Armour thyroid, my weight eventually creeps up, but it doesn’t tend to do that with the OTC “ThyroGold” (which contains a small amount of Forskolin). Now that I’m back on Armour thyroid, I’m supplementing with this product. I only need a small amount- I divide one capsule and take it just once a day, though they suggest a whole capsule twice daily. It really does seem to help.Meal Replacement Powder (by Dr. Schulze)– Sometimes it’s easier to stick with a program if you remove a lot of the options. This powder supplies tons of nutrients from natural sources; being well-nourished might help ease cravings too. I start my day with something like this (my own blend), and it seems to work! Swerve Sugar Replacement– My bottom line: I believe we need to train our taste-buds to crave less-sweet foods. But this can be difficult! So, meanwhile, there is “Swerve”. I like that you can replace sugar in recipes with an equal amount of this, and it will bake just like sugar (it will even brown and caramelize). It is made with natural ingredients, but it won’t give you the calories of sugar, or mess with your blood sugar levels. “Tweaked” to produce a sugar substitute that’s better for you than any of the artificial sweeteners on the market (Equal, Sweet’N Low, Splenda), it uses erythritol, a sugar alcohol, which isn’t completely absorbed by the body. It also contains oligosaccharides, which are just non-digestible carbohydrates from fruits and veggies. This type of fiber actually gives our gut flora “something to chew on”, meaning: it contributes to a healthy gut! Vitafiber Syrup– I’ve made some “Quest Bars” with this stuff- just heated 1/4 c. of the syrup and mixed in 5 TBS. whey powder (I added a bit o’ salt, spice, cocoa powder too). Easy to make, easy to eat when energy runs low, while keeping carbs to a minimum. This stuff is made from various natural starches, fermented to yield a sweet syrup that we don’t digest as a sugar. So- it helps with glucose tolerance and digestion, and may even improve sleep! Compost Caddy, Black (or other colors), 2.6-qt.-Isn’t this just the cutest compost caddy?! We used an old tin olive oil can for years, but it’d get rusty and nasty and need replacing. This is much nicer, especially in the vintage blue color; also available in red. Electric Water Kettle, Cordless, Stainless Steel,1.5 Liter (6-Cup)-This electric water kettle shuts off by itself- s0 convenient (especially for those of us who start a pot to boil but might forget about it). Also, it’s not made of plastic, which can eventually break down. I love the stainless steel- I’ve used mine for years. Every day! Ice Cream Maker– This Hamilton Beach machine is quite economical, but makes excellent ice cream. (I can vouch for that personally!) Yes, you need to add rock salt and ice, but it works great. Up to four quarts of ice cream in 20-40 minutes! Ice Cream Maker, Fancier– This machine won’t even need ice and rock salt. It’s completely automated. Well, except that you have to put the ingredients together! It makes a quart and a half per batch. Immersion Blender– When The New Deli’s commercial model acted up, I discovered this could be a handy back-up. The commercial immersion blender had cost almost $300, so I loved that this one was just $89.95. Yes, there might be cheaper models, but this one is 850 watt, so… that was cool. Works great! Iron Skillet, Pre-Seasoned, 12-Inch– The iron pan is so versatile. It can take the heat and get scorching hot (great for searing and grilling). A favorite feature: this iron skillet cleans up easy- I don’t need to scour it! Kitchen Timer– Of course we can go through a lot of timers at The New Deli… This timer has 4 separate timers in one, and a cute little whiteboard attached, to write what each one’s for. AND it’s real user-friendly. This is our fave timer so far! Knife, Forged 8″, for bread– This brand is respected for a reason. I reviewed quite a few before settling on this henckels serrated bread knife for The New Deli. We cut so much bread, and other serrated knives just don’t stay sharp. The Henkel knife is so great we almost fight over it during lunch rush. (Don’t get in our way!) So I got another to replace one of our other cheaper knives. Love it! Kombucha Brewing Dispenser, 1 gallon– This is my favorite for kombucha brews. So easy to do the “continuous brew” method; I just dispense a bottle of kombucha from the spigot, and add more sweetened tea at the top. Boom- done! Kombucha Beverage Dispenser– Here’s another model, which includes a stand too. Kombucha Dispenser, Small-size, 2.5 Qt.- So I really like these things! I have several. This small one’s great if you don’t need too much brew on hand! Oil Dispensing Bottle, ceramic, red– I like having my olive oil bottle handy on the counter, but don’t want light to deteriorate it! This looks cool sitting out, and a drizzle comes out perfectly. Pressure Cooker, Stainless Steel, 6-Quart– Excellent for making stock, saving energy and time. The sealed lid on this stainless steel pressure cooker keeps the heat in; foods can cook on low with no worries about scorching, in a fraction of the time. And the stainless steel doesn’t react with some foods like an aluminum one can. I love mine! Pressure Cooker, Programmable, 6-qt.-This pressure cooker cooks; it also sautes, cooks rice, and slow-cooks. Plus, no chance of lead or aluminum leaching into food, as it comes with a stainless steel insert (with a triple-bottom-layer) I already own the above pressure cooker, otherwise this would be a step up- folks love it in the reviews. Slow Cooker, VitaClay, 6 Cup/3.2-Quart– I got a little paranoid about lead leaching out of the ceramic glaze in my ancient slow cooker (from the eighties), so I found this clay pot slow cooker to take its place. It doubles as a rice cooker, digital steamer; even as a yogurt maker. Or, more traditional- I just put a bunch of veggies and meat in mine, and it cooks everything tender. Seems real low-energy too. Soap Dispenser Pump Sets for Mason Jars– We’ve gone through a lot of soap dispensers at The New Deli. Some rust, some just fall apart, some squirt soap across the room (one even at one of our customers). We’ve concluded that this particular set of two pumps is the best. It got great reviews, and doesn’t rust, and works great! We love ’em! Soap Dispenser, Wall-Mounted– We needed one of these at the deli and liked it so much that I ordered one for home (a smaller model). This is perfect for soap- nice and clean for guests, and it doesn’t squirt across the room like some we’ve had. Spice Rack, 18-Bottle– I love my compact, highly usable spice rack! I keep it in the cupboard (spices last longer out of the light). AND, it’s much more economical to get herbs and spices in bulk, and fill your own spice jars. Spice Grinder, Electric– Grinds coffee too, and has stainless steel blades. I’ve used it as a spice grinder and flax seed grinder too, after finding that most blenders won’t process tiny things like flax seeds very well. But this does! Sprouter, Triple-tray– I am a sproutin’ fool, I’ve got nine of these sprout trays. Well, I do keep everyone knee-deep in sprouts. That’s why The New Deli always has way better sprouts than the grocery store. Best design ever. Vita-Prep Food Blender– This model is best-priced, still top-of-the-line. Even grinds grains! (It’s that tough.) I love mine. At The New Deli, we went through sooo many blenders. Yes, they were under $50/each, but multiply that by ten or more and you realize- the VitaMix is a good value. It’ll last you! Water Filter, “Clearly Filtered”– Berkey’s my favorite filter, but if you don’t want to invest that much money right now, you might try this particular filtering pitcher. It does get out the chlorine and fluoride (plus other stuff), so it’s preferable to many other products available. Activated Charcoal, Hardwood- Best way to whiten your teeth; activated charcoal is real healthy for your gums too (nice and alkaline). Yes, it can get messy if you’re not careful, but- white teeth are a plus.Bar Soap, Pure Olive Oil– This is officially my fave bar soap (or tied with Dr. Bronner’s)- it’s the purest of ingredients, at the best price. Love it! Brush, Dry– This is for dry-brushing your skin. It improves circulation and sloughs off old dead skin cells. A healthy, invigorating morning routine! Candle Holder Cylinder, Carved from Himalayan Crystal Salt– Natural air purifier, this himalayan salt candle holder holds one tea light. Plus, it looks cool too. Candles- Pure Raw Beeswax Tea Lights– These natural beeswax candles fit nicely into Himalayan Salt Candle Holders. Plus they’re non-toxic and chemical-free. A good deal- 24 votives! Candles, 100% Pure Raw Beeswax, 10″– Skip the toxic chemicals found in many candles; go au natural with these beeswax candles. Lovely, elegant, clean, green, and totally cool! Chalkboard Labels, Reusable– Give homemade gifts a personal touch with these cute, reusable chalkboard labels! I use mine on my own jars, plus homemade gifts. This packet seemed the best value- many different sizes. A permanent chalk-pen writer works well with these. Cocoa Butter, raw, organic, non-deodorized, 1 lb.– Super cool ingredient for body butters- natural healthy skin care! And this cocoa butter smells like chocolate, nom nom… I even use it when searing fish on super-high heat. I hear that some master chefs do this too- it holds up to heat well, with a pretty low smoke point. Dryer Balls 100% Wool (Reusable)– These dryer balls really work! Why waste more for electricity (or gas) to run your dryer, when these can bounce around with wet clothes, aerating them and getting them dry faster?! A great, all-natural fabric softener too. Face Cream, Dr. Christopher’s All Natural– This natural face cream is actually a great value. It’s not watered-down; you only need the smallest amount. Perfect for overnight skin care (it absorbs by morning, leaving skin super soft). It seems to tighten pores (must be those herbs in action), and it helps with broken blood vessels. I needed something top-quality after getting bad road rash from an unfortunate roller-blade accident. This blend of herbs and quality oils really helps. Note: some might call it a “skin cream”, finding it too thick for the face. In that case, it’s great for conditioning cuticles and such! Glass Jars, Amber, Straight Sided, w/cap, , 4oz, 24/case– These jars will hold homemade balms and butters quite nicely. Perfect for gift-giving! Glass Jar, w/lid, 135-1/4-oz. (approx. gallon-size)– Glass jars are pricey everywhere. But these glass gallon jars from Amazon include an excellent clasp and rubber seal for great storage of foods (kombucha and such too). A worthwhile investment! Glass Spray Bottle, Blue– 16 oz.- Like above, only blue! Shampoo, Dr. Christopher’s All Natural– It’s hard to find truly “natural” shampoos. I’ve tried several but not been totally pleased. The salon shampoos are nice but quite pricey; a soap nut shampoo I tried was certainly natural, but didn’t quite “deliver” (no, my hair did not become spectacular). I love this one- it’s like aromatherapy for your hair! Lots of natural oils, no synthetics. Soap, Dr. Woods Black, Original Castile– This is another soap option for those with delicate skin. My grandson’s eczema is greatly improved with this. A few of our New Deli girls prefer this soap over others, to heal their dish-washing hands, and most of our girls loves this scent the best. It’s a super-great value for an excellent, natural, healing soap. Soap Nuts / Soap Berries (pieces), Hypoallergenic, Non-toxic– Amazing, green, “clean” way to wash clothes, at around 7 cents per load! Add 5 soap nuts to the included mesh bag, add to each load (hang to dry; reuse to wash 5 more loads). I actually “brew” a half-gallon of liquid from these berries now, to get even more cleaning power. Love it. Sunscreen UVA/UVB Protection Loose Zinc Oxide Powder– I didn’t think I exposed my face to the sun that much, but I did have a few age spots. After using this stuff for a few months on my face, under makeup, my spots faded. A lot! Regular sun screens irritate my face; not this stuff (the skin can’t absorb it, so it’s non-irritating). I transferred the powder to an empty powder powder puff container I had on hand, so it’s easy to use. Pure Zinc Oxide powder is the cheapest sunscreen around. It can also help with other skin blemishes, acne, and inflammation. Tongue Sweeper– This tool can be used first thing in the morning, to scrape tongue, remove old stuff, improve breath. Tooth Powder, Uncle Harry’s– We were using a cheaper, homemade tooth powder for awhile (recipe here), but I’m back to using this more-convenient product. It’s still pretty economical, even though it looks pricey. (It lasts a long time…). The dentist says my teeth are less tea-stained. Well, could be this, or maybe it’s the warm lemon water first thing. Either way, love this stuff. And, no fluoride (an endocrine disruptor). So that’s cool too. Bible, Good News Translation– I love this version, and the font size is easy enough to read. And it’s hardcover! This translation can be described as “paraphrase”, meaning translated thought for thought instead of word for word. Maybe that’s why it seems like a great translation for recent generations! I love it, and it’s a great value! Jennifer Cote: From the Land of Milk and Honey– My first cookbook- includes 85 fave recipes, plus a little soul food (scripture and such). After all, we don’t live by bread alone! 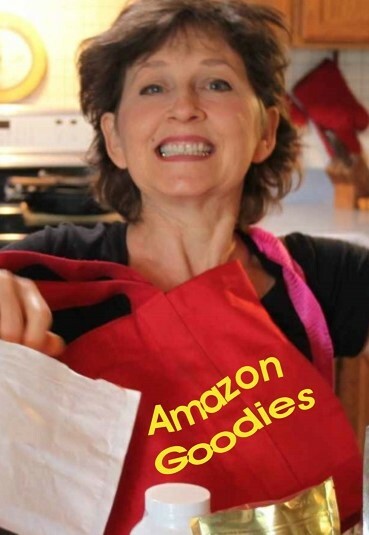 Jennifer Cote: SOUP’S ON!– If you want all my soup recipes in one handy place, with a picture for every soup, this is a good cookbook to have. Available for your Kindle, or your computer, phone, etc. Julia Child: The Way to Cook– Fads come and go, but Julia Child’s book is a classic, for those who really love cooking. She presents the “master recipe”, and variations, along with great technique. For a good “How To” book that teaches cooking from scratch, get this, and avoid other “classics” which teach how to turn packaged goods into recipes. We don’t need a book for that, do we?! Martha Stewart: Entertaining– So much inspiration, from an entertaining icon. Pictures are fantastic; even the place settings lend some great ideas. Mary T. Newport: Alzheimer’s Disease: What If There Was a Cure?– This author’s findings gave me so much hope, in dealing with my mom’s diagnosis. AND, I started implementing the diet suggestions for our whole family. No complaints yet! William Davis: Wheat Belly Cookbook: 150 Recipes to Help You Lose the Wheat, Lose the Weight, and Find Your Path Back to Health– OK, maybe that “wheat belly” is made up of other stuff too. But author William Davis gives us compelling information (plus recipes galore), challenging us to reconsider our eating habits. Arthur Agatston: The South Beach Diet Supercharged– I’ve been following something akin to this plan. Other friends have had success with it too. Paleo often stresses the beauty of “good fats” from grass-fed beef, free-range chickens, etc., as well, but other than that, both seem to have their pluses! Sally Fallon: Nourishing Traditions (The Cookbook that Challenges Politically Correct Nutrition and the Diet Dictocrats)– If you’re eating to get healthy, you might consider this view (which is not coming from any special interest food group). Sally Fallon (and Mary Enin) are a treasure-trove of info!